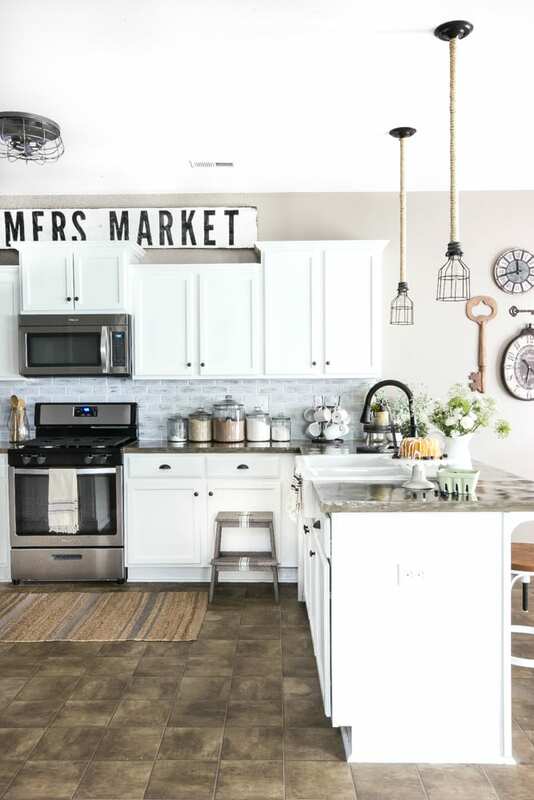 A dark and boring builder grade kitchen gets a budget-friendly makeover with modern farmhouse style using 100% doable DIY projects. I can’t believe it. 2.5 years, 2 gallons of paint, countless buckets of concrete, and a ton of sweat equity later… kitchen reveal day is HERE! I know you can’t see me behind your computer screen but I’m dancing and doing cartwheels like a maniac. 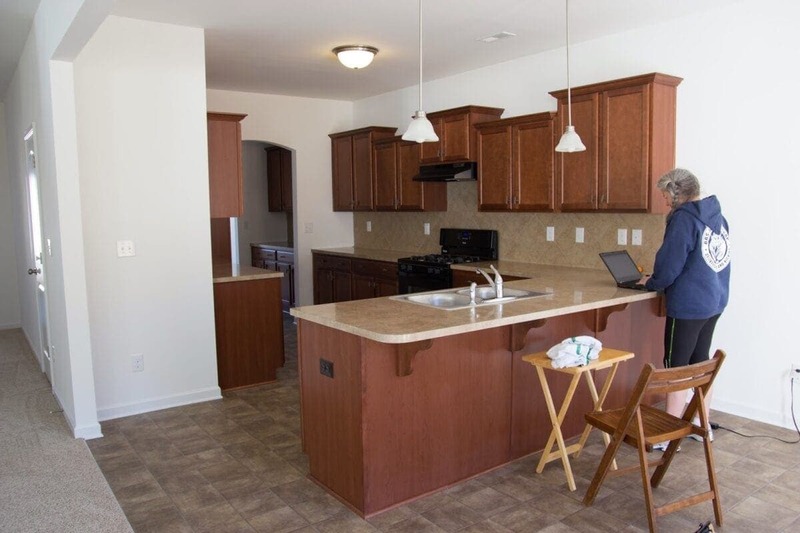 In case you need a refresher, this is what our kitchen looked like the day we moved in in December 2013 (along with my mother-in-law, Barb, there). Really, even our “before” wasn’t much to complain about. Robert and I have been very thankful that we were able to build a new house and only have to focus on personalizing our house’s stock builder features. 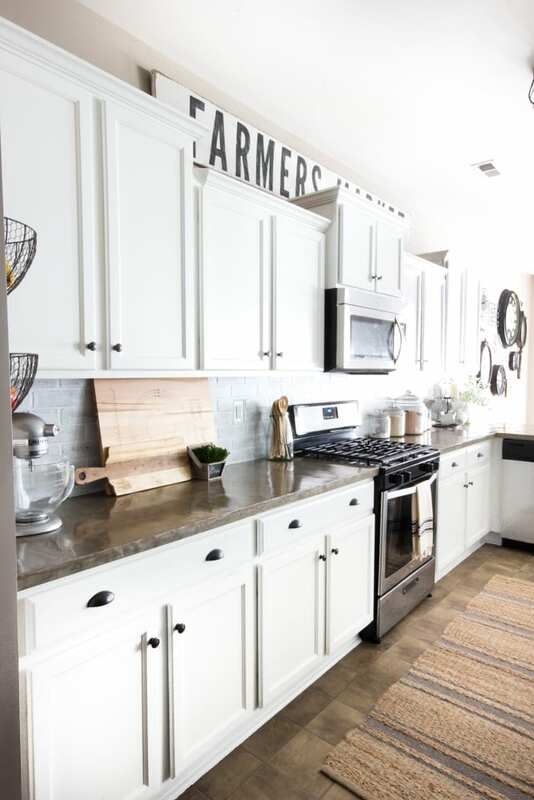 This was definitely not a labor-intensive renovation or pricey update on an old kitchen like many homeowners typically face, so that alone helped tremendously. Within the first few months we were here, we painted the walls, changed the lighting, painted a chalkboard wall, and then everything stopped. Since we have no windows in our kitchen, painting the cabinets white was sort of a no-brainer. Our dark wood cabinets before made this space look very cave-like and the red undertones clashed with the rest of our decor in the house. Maybe I’m weird, but I actually like being able to see if there is a smudge of dirt or bits of cooking grease on our cabinets so I know with a glance what needs a quick wipe down. But really since we painted them a month ago, they’ve stayed very clean so far despite our love of frying bacon. 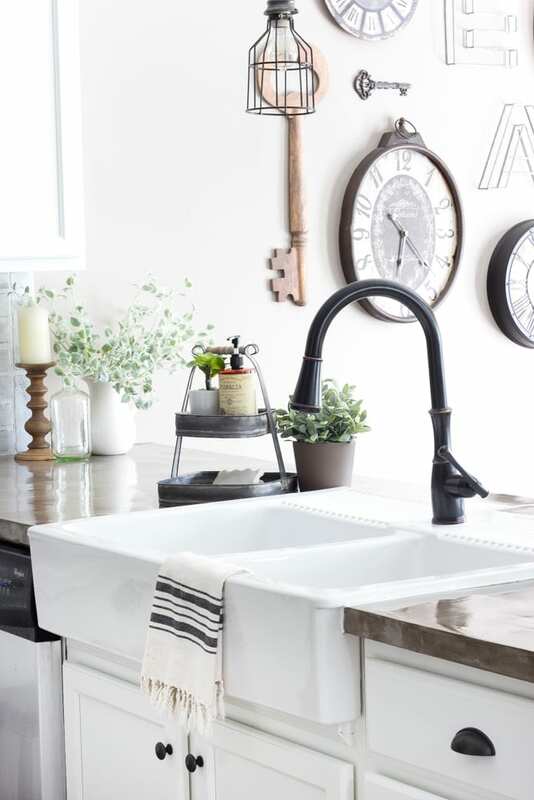 One thing that was always impossible to keep clean before was our stainless steel sink. And washing pots and pans underneath that squatty faucet was a big ol’ pain. Originally, I’d planned on a white drop-in sink, but so many of you gave me the courage I needed to cut into our countertop and cabinet (so scary but we did it!) and install our huge farmhouse sink that we picked up at IKEA for only a little more than the standard white drop-in. Robert and his dad got major brownie points for pulling this one off. 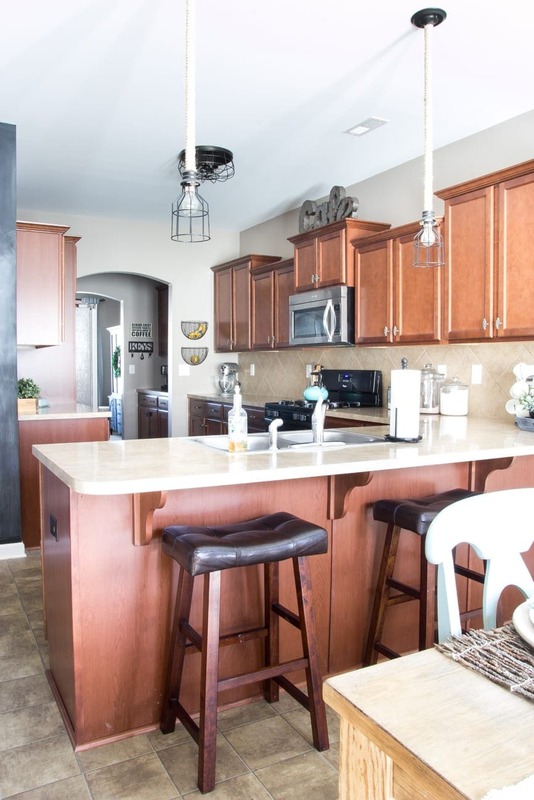 We originally had beige formica countertops and a beige tile backsplash that I was never in love with either, but it was the standard option from our builder. After wrestling with several layers of concrete for the countertops and placing white washed faux brick paneling over our existing tile, I’m absolutely thrilled with how they both turned out. We eventually swapped out our black gas range for a stainless steel one too thanks to one I scored during a 30% off appliance sale at Lowe’s. And even though we weren’t financially ready to change our vinyl flooring, we’re totally okay with it right now. This striped jute rug I got for 40% off helped a little bit too. It really is like night and day. I could not handle the darkness anymore. Painting those cabinets has definitely been the biggest transformation in here. Baking parties with Olivia are way more fun in here now… even though I totally cheated and bought this one at the grocery store. She loves climbing up on one of those barstools to eat her lunch every day, and I don’t have to worry about cleaning up behind those little swinging feet of hers since the Stikwood we installed protects our bar. Last week, on a whim, I dug into our scrap wood pile and made that Farmers Market sign using paint I already had in my stash. Best free decor ever! I love how it turned out and how it fills that awkward space above the cabinets. I didn’t really count our DIY wood beam in our kitchen makeover since it connects our living room, but it makes a big impact in here too. And it ties in well with our chalkboard that we also framed using reclaimed wood from our scrap pile. Robert’s parents cleaned out some of their barn and gave us all kinds of pretty reclaimed wood pieces that we’re so excited to hopefully build some furniture with in the near future. 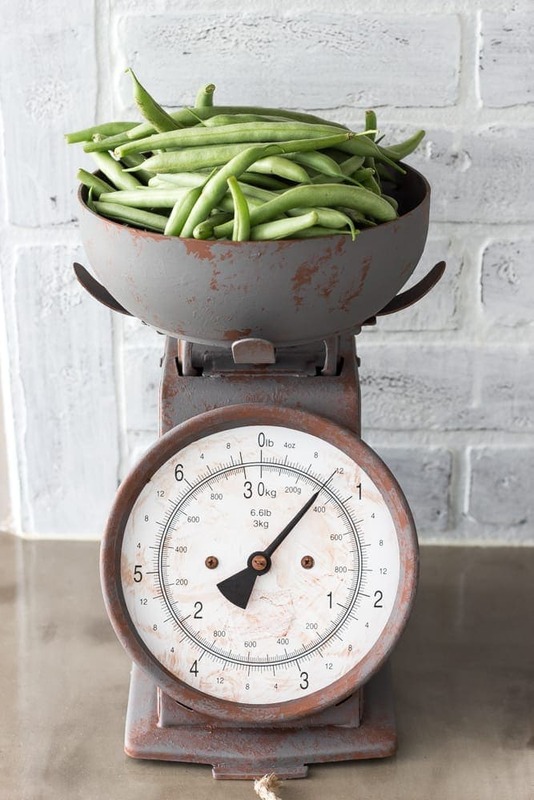 For some of the small decor items, I was lucky enough to find some great thrifted pieces like this food scale that actually works! I gave it a painted vintage look though since it was a beaten up stainless steel before. Whatever veggies we bring in from my parents’ garden or our backyard garden box, I like to display them in the bowl on our scale until I get a chance to cook ’em up. 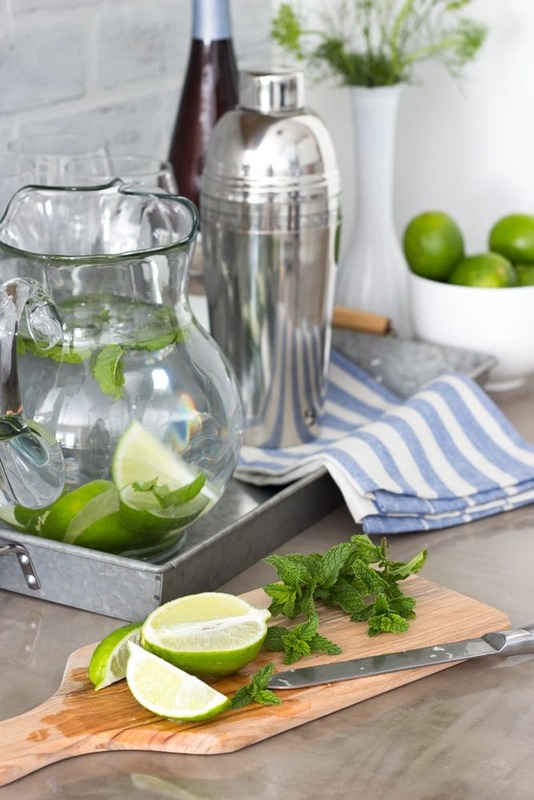 I’ve been tiptoeing out into our backyard to snip mint leaves for mojitos lately too since summertime is always a big entertaining season for us. This spot beside our fridge is great for setting up our drink station. 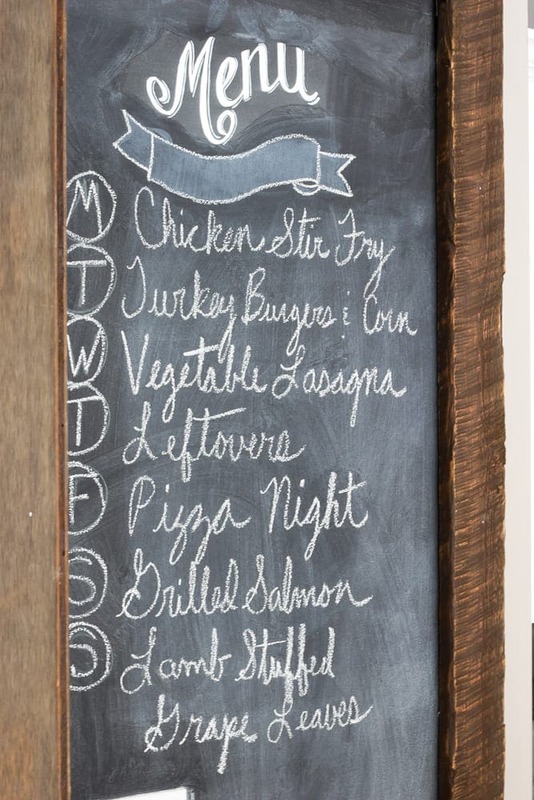 On our chalkboard, I still make it a habit of planning our meals for the week and there’s a little space at the bottom where I can jot down items I need to pick up at the store or where Olivia can draw while I’m making dinner. A couple of years ago, we hung up these wall planters to repurpose as storage for our fruit and veggies and I liked them so much, I just left them there. And this little tiered tray comes in handy for storing dish sponges and soaps and things next to the sink. That’s pretty much it! It’s hard to believe we really only have 2 rooms to go before our entire house is finished. (You can see the rest of our room reveals here.) The playroom and laundry room our the last two spots on my hit list… and maybe a couple of closets sprinkled in there too. I went completely bug-eyed when I calculated our final cost of this makeover. This was definitely the most expensive room we’ve ever done. But considering we got a new stove, new sink/faucet, new countertops, backsplash, painted cabinets, stools, and lighting, plus all of the small decor items added in, that was a pretty tall order to begin with. Our kitchen is 20′ x 12′ so size played a major part in that too. In the end, I think we spent nearly as much eating out during the 3 month process while this room was periodically out of commission for cooking meals. Have you ever tackled a huge kitchen makeover before? Or plan on one in the future? I’d love to hear any budget tips you’ve used in your own kitchen reno so we can all help each other out. 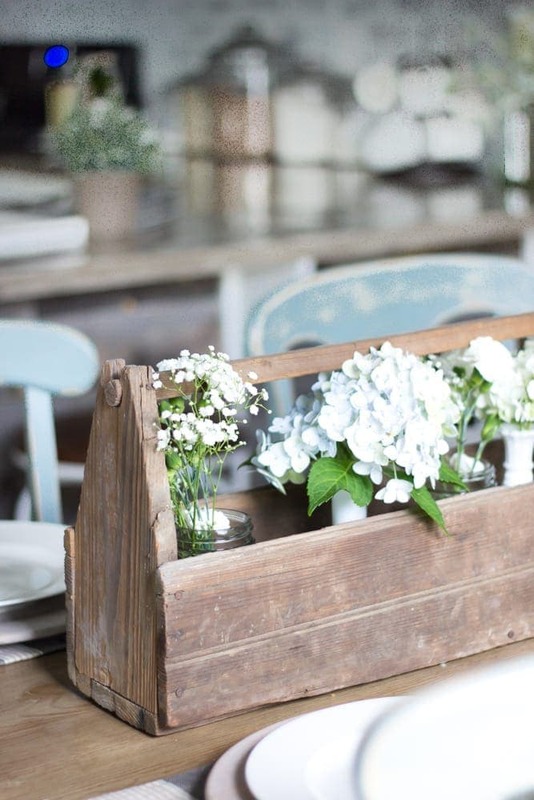 And if you’ve ever felt intimidated to makeover a huge space, you can do this! Just take it one step at a time. It’s incredible what just paint alone can do. It looks beautiful! So happy for you that you finally got your white kitchen cabinets that you have been dreaming of for so long! I’m also planning on painting our kitchen cabinets white, at the moment it is South African 1970’s style steel kitchen cabinets in icky mustard yellow… You just gave me the guts to really go for it! Hi Lauren! 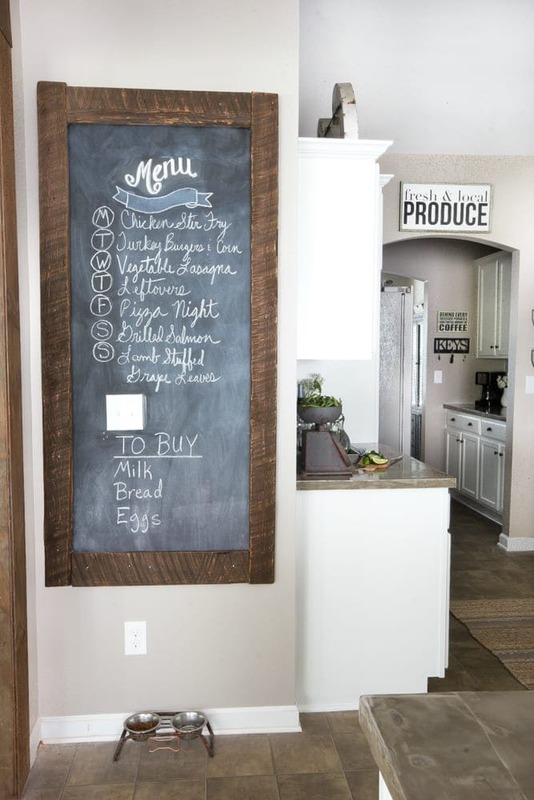 I’m LOVING everything you and your hubby did to make your kitchen just stunning! I really want to make the farmers market sign! Can you please give me some pointers?! How’d you do the letters?! Hi Farrah! The sign tutorial plus the letter printables will be going live next week on Remodelaholic! I’ll be sharing the link here when it’s up. Beautifully! Just a few spots around the stove where grease splattered and seeped through because we didn’t stay on top of sealing it. If you keep up with sealing it twice a year, you should be okay. 🙂 We moved out of this house last year, but we went back and visited the new homeowners there a couple of months ago and it still looked as great as the day we moved out. Congratulations, If I was there I would dance all over that kitchen with you. Everything is perfect! Everything!!! And I also noticed how you pared down the chalkboard. It looks so much better now that it is framed. My dear, what are you going to do when you are finished with the house? Maybe come over to mine? Thank you, Linda! Yes, John and Sherry are chock full of so many great tutorials. They were the ones who convinced me to choose the Benjamin Moore Advanced paint and they were so right. It is SUPER durable. Cleaning them so far has been really easy for us too. Absolutely stunning transformation Lauren! Yes, the totals when they add up like that can make a gal go bugged eyed and a little anxiety set in as well, but I can tell you, having just redone my kitchen (hood still needs to be installed and the backsplash) that you saved and scored MAJOR in your DIY remodel and it looks just as amazing as if you’d redone it all with new! Way to rock it!! So love visiting your blog! You are a total inspiration to me! And the fact that you can do what you do on a budget and still have it look as awesome as it all does, gives me courage to keep pressing on and not get discouraged because it proves that you can totally have a designer look without the designer price tag! Big thumbs up and high five’s! Aw thank you SO much, Jana! I am so completely thrilled to hear that. 🙂 Thank you for making my day! I totally LOVE it!! Great job guys! Appreciate your efforts to inspire….I’m inspired 🙂 Thank you! Looks amazing! Still waiting to finish ours, ours was almost a complete gut so it’s taking a bit longer. The end product will be so sweet, though 🙂 Congratulations on a beautiful kitchen! Whew! Yeah, I can’t even imagine the gut job makeovers. I’m sure it’s very overwhelming but so worth it in the end. 🙂 Thanks, Erin! It’s absolutely gorgeous! You are sooo talented and I’m totally going to steal some of your ideas! 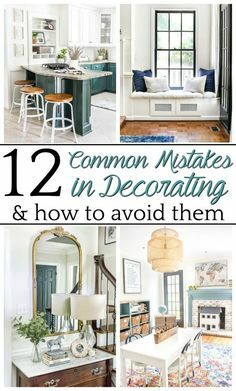 I really, really want to paint my cabinets and had it on my “to do” list for this summer but other “family” issues have come up and need to take top priority! The only suggestion I would make is to add a bracket under the end of the kitchen cabinet (like the ones under the bar) to finish off the brick backsplash! Otherwise, you nailed it, girlfriend! Thank you, Debbi! Maybe the fall would be better to paint cabinets anyway. Not as hot. 😉 I finished ours in May right before the crazy Southern summer heat and whew! I’m so glad I decided to tackle ours in the cooler spring weather. What is the price of the Stikwood? It depends on what kind you get, but ours was $14/sq ft.
Do you like it? Is it holding up well? I just discovered it and am hoping that it is as wonderful as it seems. Awesome job, Lauren! I love all of it! Will you be posting a tutorial on your Farmer’s Market sign? 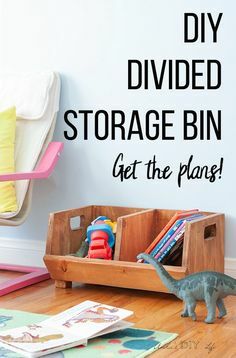 I want to make one and was wondering what materials you used! Deet, please! Also I think your end total is unbelievable for everything you did…my husband and I did a complete (-ly necessary) gut job of our kitchen and I honestly don’t know how much it cost but it took us 2 years to pay it off! 🙁 Good for you for getting what you want for not a lot of moola. It is just beautiful!! Thanks, Amy! Yes, I will be sharing a tutorial of our sign. It will go live on Remodelaholic in a month or two, and I’ll post the link to it when it’s ready. Yeah, kitchens are definitely not cheap! Not having to do a gut job helped a lot. I can’t imagine! I’m sure you’re so glad yours is done. It’s all gorgeous, Lauren! Great job! What an amazing transformation, great job and a lot of hard work. We are planing to paint our cupboards white in the near future as well, always inspiring to see the before and after !! Your kitchen is what dreams are made of. I love how it all came together. I’ve been wanting concrete counters forever. Maybe in my next home!! Just fantastic, Lauren. I LOVE it. So well thought out and executed. And I am even more proud that you do everything with cash and no debt. That is amazing. Well done! Thank you, Lisa! Yeah, definitely can’t be accumulating the debt on home makeovers. For a renovation on an old house with an equity loan, I can understand. For our situation, that wouldn’t make much sense. It’s absolutely stunning! I think you should keep the tile floors. I thought they looked a lot like wood at first glance. I am pinning this to use as inspiration for what I want in my kitchen! White kitchens are definitely not for everyone. 🙂 I can appreciate pretty wood cabinets, but they’re just not “me” and felt too dark in our window-less space. Everything is just gorgeous! I’d love to know how you made the farmers market sign, I definitely thought it was store bought! Absolutely gorgeous! Great job. 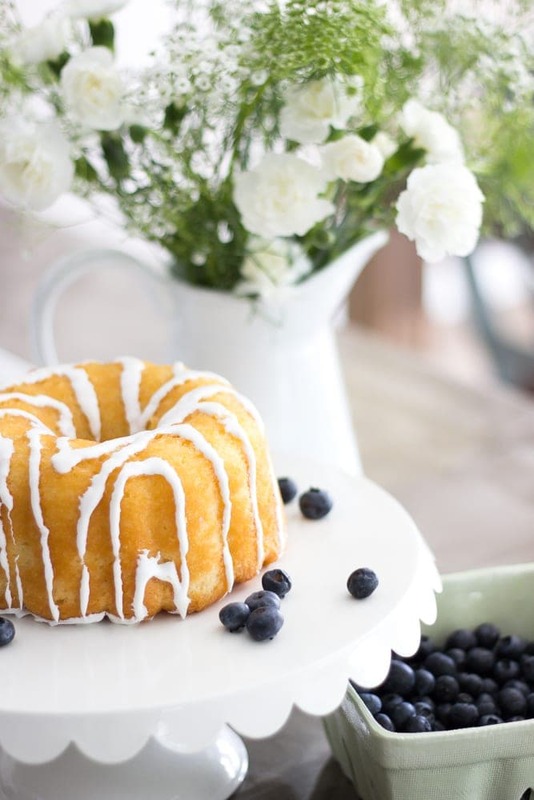 You should stand there in the kitchen and stare. I would too. Haha! Oh, I do. 🙂 Thank you, Claudia! I had to pick my jaw up off of my desk! WOW did that turn out GORGEOUS!! Hi Lauren. Your blog is one of the very few that I actually read (…do people ever admit that?). It makes me happy. Your tone about life in general is joyful, and I love that! Even when projects don’t seem to go just right, you always seem to find a lesson in it and for me, it helps me learn to be fearless. Your kitchen is lovely! Love how you break it all down for us at the end. I can’t wait to find the faux brick info on 7/16 (that’s not a plug, I really mean that!). Thanks for sharing. Wow! Thank you so much, Kathy! That is so sweet of you to say! You don’t know how happy it makes me to know my little blog helps you. 🙂 I’m sooo excited to share about this backsplash. I’ll post here on Saturday with the link to the tutorial, so hopefully you won’t miss it. It looks wonderful. And that you got that stove for less than $500 is a statement piece. I’m not spending on myself for a bit because I need a new sink and faucet and countertops and need the cabinets painted. Yours were truly pretty beforehand. A nice size. Mine look odd!! So short and TALLLLLLL ceilings!!! I like how you have done so much to make your home your own!!! Beautiful job, Lauren! All your hard work paid off. It looks amazing! Thank you so much, Trish! Hope you’re doing well! Your kitchen is beautiful! I believe when you say doing dishes isn’t such a chore now. Y’all will enjoy this room for years to come!! This makeover is absolutely wonderful! Comparing the before and after picture…it is SO much better! You guys did a fantastic job and all the personal touches are just right! Enjoy!! I love it! So glad you decided on the farm sink! It makes the kitchen! Everything is so perfect! You can come to my house anytime to help me! Lol! It really looks so nice! Thanks for sharing. Blessings to you and your family. ❤️?? 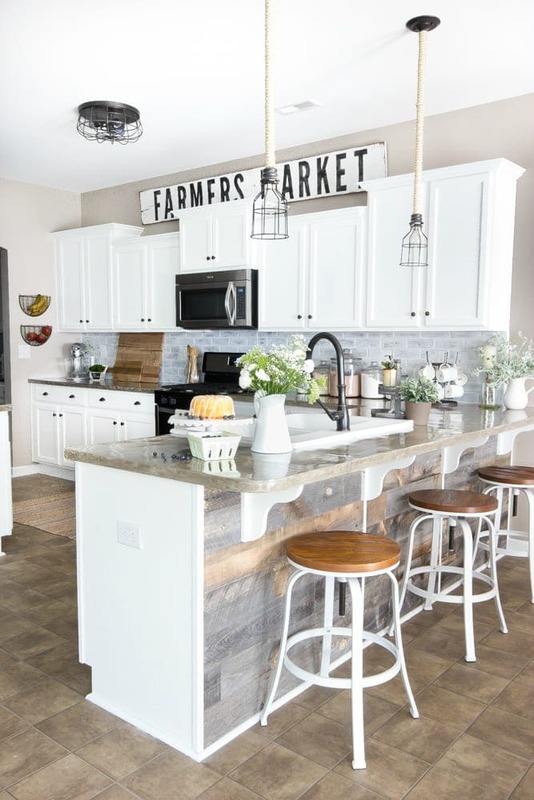 everything about this makeover is exactly what I’d like to do in my kitchen! Beautiful! I LOVE IT!! You did an amazing job. So many ideas I could use! I’m going to show this to my husband right now – He’s going to be soooo happy LOL!! ? LOL! My husband says all the time after we finish a project, “I bet so many men absolutely hate me with all of these wives everywhere getting these DIY ideas.” It’s a love/hate thing, right? Haha! Lauren it turned out amazing!! I love all of it. Such a great use of texture and color!! I love everything you did here. Your eye for detail is absolutely on target. Thanks for sharing. Wow! Your kitchen is beautiful! As I was scrolling through and saw the farmer’s market sign, I said to myself, “I’m going to ask if she made that…” Continued scrolling and got my answer! Don’t worry about the floor, everything about your kitchen draws the eyes upward to take in all the wonderful lightness, brightness, and details. Enjoy! I’m about to start a kitchen remodel. It involves rearranging work areas to make the kitchen flow better and it is scary. It is such a pricey undertaking that you want to be sure to get it right! I’ve researched work triangles, islands, etc., etc. I’m considering a cook top in the island and double wall ovens I’ve always wanted. People ask what your plans are, you tell them, and then they start saying why they would NOT want a cooktop in an island……..Does anyone out there actually have experience with a cooktop in an island? That’s who I’d like to hear from! I’ve seen big ranges with full size double ovens in them, side by side, and that would be a whole different approach! Costly, too. I feel very confident about the new location for the dishwasher and change in dish storage location. Input welcome! Thanks. Thank you, Karen! I’ll be sharing all about how I made that sign in another month or two on Remodelaholic, so I’ll post here know when the tutorial is live. It was pretty simple though. 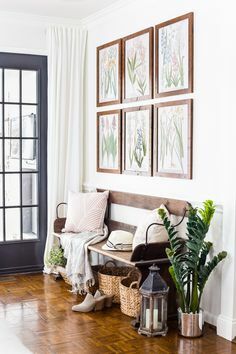 Just paint a plank of wood, stencil, sand with coarse grit, and hang. 🙂 My grandmother actually just had her kitchen remodeled a few years ago and she did the exact same thing putting a cooktop in her island. I think it works great that way! I’d just make sure you have good ventilation there, but I’ve definitely seen it done. I say if you love it, go for it! Hi Karen, Just wanted to let you know my sister-in-law has that set-up in her kitchen, cook-top in island and oven/micro combo in wall next to fridge. When it comes to holiday cooking with our big family it makes it easy for many cooks to work on different things. Those who are baking are not interrupting those at the cook-top. The flow is easier. So I say if that’s how you want yours to be then go for it, you won’t be disappointed. Thank you so much, Lanita! It’s been quite a job but soooo worth it! Thank you so much, sweet friend. Can’t wait to see you at Haven! I think I saw that you’re making the trip?! Congrats! Such a dramatic change! I love it all. I had that IKEA farmhouse sink in a house we built. Used it for 6 years until we sold our house. I LOVED it! 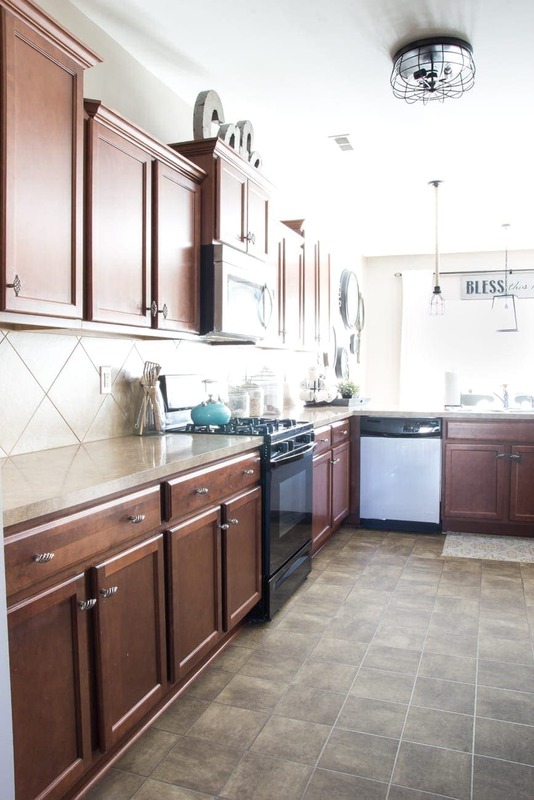 We are moving into a mobile home with dark cabinets (until we can build again)….I might just have to paint the cabinets white! Love all your ideas…thanks so much for sharing. Enjoy your beautiful kitchen. That Farmer’s Market sign is so great. How did you do the letter’s so perfectly? Thank you, Cassie! Yes, this sink is a DREAM! I’ll definitely miss it if we ever move. For the sign, I’ll be sharing the tutorial later, but I made the letters just by printing them individually on cardstock, cutting them with a utility knife to make stencils, taping them in place, and dabbing with a paint brush to help prevent bleeding. Love it.. I am about to start this whole deal in about 2 wks. 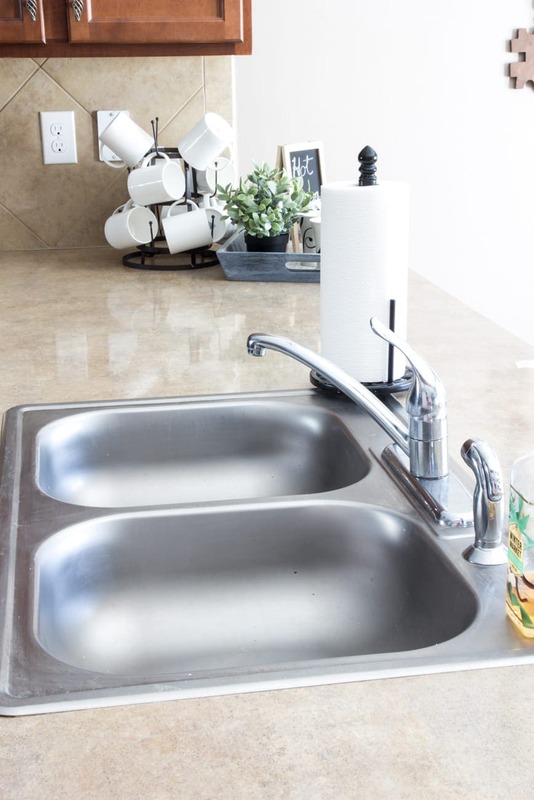 Concrete , backsplash and cabinets.. Did you have a hard time with the sink? 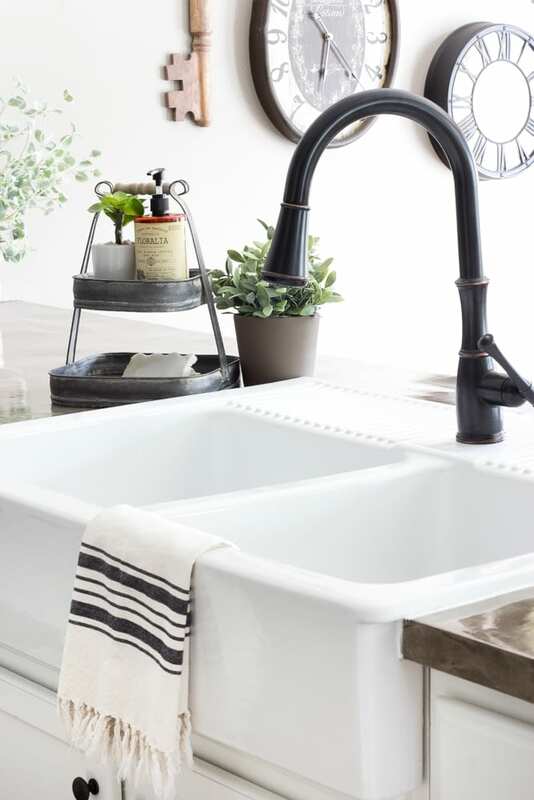 I would love to get a farmhouse sink but how do you make it fit? Can I do this on my own? 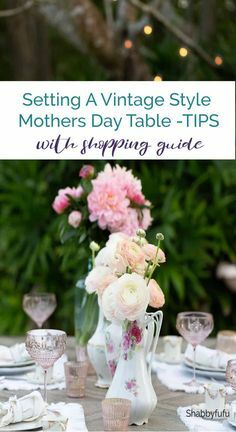 Lauren, I always enjoy your blog posts and am really impressed with your DIY skills and creativity. Regarding your Farmers Market sign: what are its approx dimensions, i.e. : length and width, and size of the letters? Were the letters stenciled? Thank you, Nancy! The sign is approximately 1″x12″x8′ I believe. It is a real reclaimed piece of wood that we pulled from my in-laws’ barn so it already had that aged look to it. I made the stencils just by printing them on cardstock and cutting them out with a utility knife. So each letter is about the size of a standard letter size sheet of printer paper. I used the font “Francois One”. I stumbled upon this post from Pinterest searching for ideas on my families new kitchen. We are building, and I was so surprised and excited to see your kitchen is laid out exactly how ours will be!!!!! I have to wonder if we have the same builder and model ? Your kitchen is beautiful and has given me so much inspiration for my own! Yay! That’s great, Miranda! Are you building with True Homes? That was our builder. Our floorplan is called The Jasper. Yes ma’am- with True Homes out in Locust. We went with the Jasper as well, totally laid out like yours but we added the office space on the lower level for my photography work! 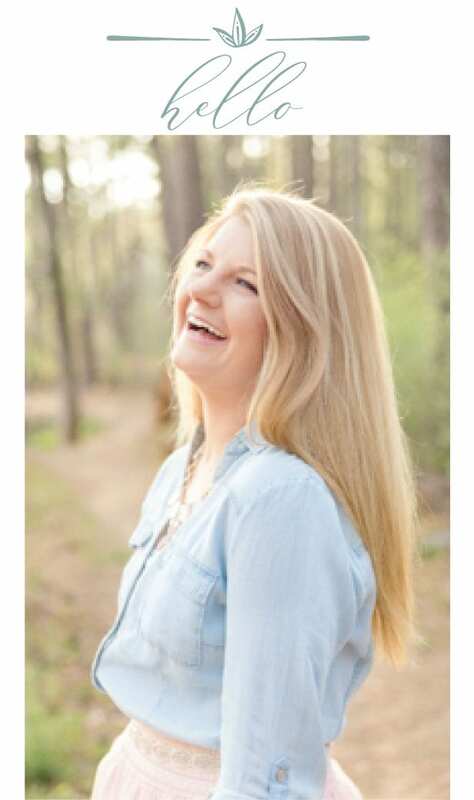 The sweet girl who works in the model where we are building tried and tried to find pictures or an actual home around that we could walk here laid out just like this but wasn’t able to so we decided on this model by faith. So it was great to be able to see it ‘come to life’ via your blog! Beautiful and makes me even more excited! Oh yay! That’s awesome! I really wanted that office too, but we couldn’t swing it in the budget. I would LOVE a space like that for blog work / photography. Next house. 😉 I’ve never reached out to TrueHomes to show them all we’ve done with their build… maybe I should. So glad I could give you some ideas, Miranda! Wow Lauren, this transformation is absolutely amazing! I can’t even believe it. Super impressed! I love white cabinets too.. Especially ones we painted ourselves. They are really easy to touch up! Thanks, Sara! I’ve always loved your kitchen. 🙂 So far, I’m ecstatic to be in the white cabinet club. 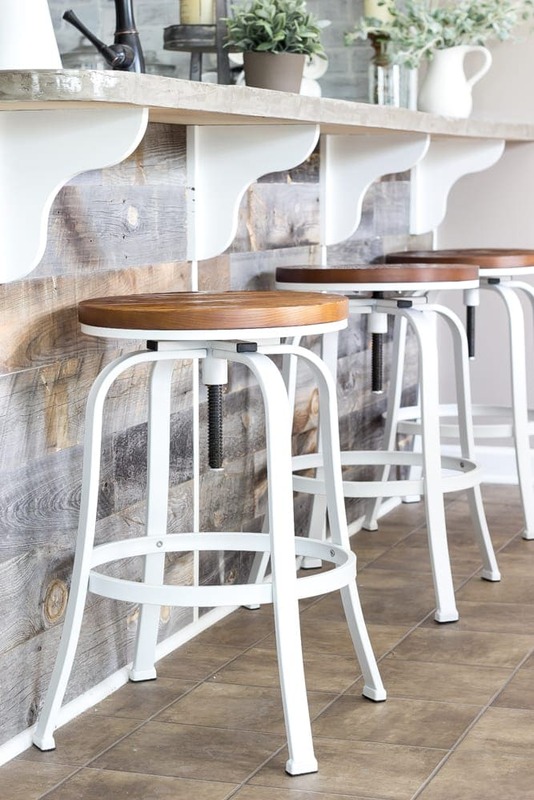 I love it all Lauren, Please share where you purchased those stools. Thank you. Love it! What are you planning on changing the floors to? Thanks! We’re hoping to eventually get a hardwood style laminate. What did you use for your backsplash? Im trying to find a backsplash just like that for my kitchen. Your kitchen is beautiful. I so want to paint our cabinets white and my hubby is afraid the paint won’t hold up. I have dreamed of a white kitchen for many years!!!! Maybe I can show him yours for inspiration. 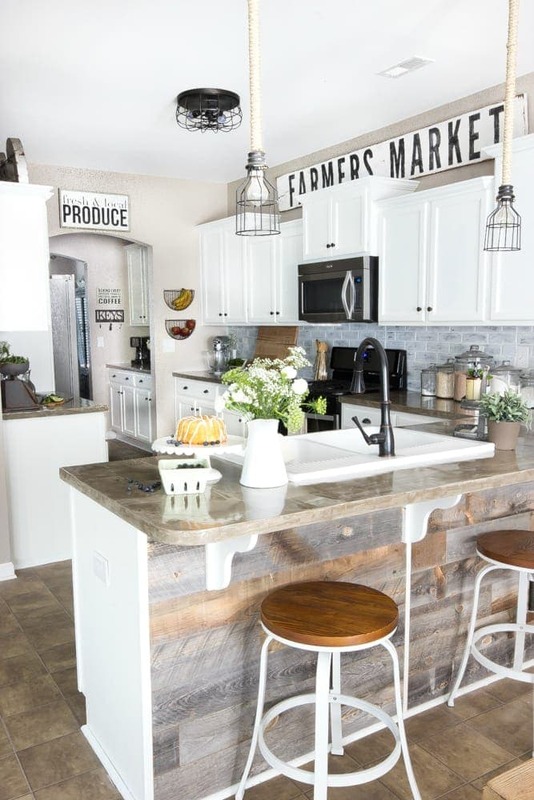 And that farmhouse sink is to die for!!!! Tell him it’s ALL in the prep work and type of paint you use. Ours are holding up like a champ! I’ve seen people use chalk paint on cabinets, but I know how chalk paint can “distress” over time. It’s faster but cutting corners will cost you in the long run. Good ol’ deglosser, priming, and painting with Benjamin Moore Advance cabinet paint is the way to go. Lauren, I am so impressed with what you did to your kitchen!! Just stunning. You’ve given me a lot to think about. So inspiring! Your kitchen remodel looks great. I was wondering, however, since you had your home built, why you didn’t just have white cabinets installed in the first place. We got to choose finishes for our new condo, and one of the choices for the cabinets was white. Thanks, Peg! Our builder actually didn’t have white cabinets as an option for their basic cabinets. We could have spent a couple thousand dollars for the upgrade to white, but that wasn’t in our budget at the time. If we had built with a custom builder, I’m sure we could have, but our house is in a “cookie cutter” track home neighborhood. I just looked at your tutorial on the backsplash, I love that look. On the end of the backsplash, what did you use as a wrap so you don’t see the layer of tile and end cut of brick panel? We have an exposed end as well and I’ve wondered how to end a backsplash without having raw end look? Thanks, Sue! For the end piece, we cut a row of bricks from the panel and attached it vertically on the end so it looks like a finished edge. Thank you, Tammy! It’s been almost 8 months since we painted them and I absolutely LOVE having white cabinets. The cabinet right above our stove does get greasy, and I give it a good wipe down about once a week with some degreaser. But I haven’t had any problems with staining at all so far. Wow! What a terrific “before and after”! Well done! It’s a warm inviting place that I can see will be well used and enjoyed for years to come. Thank you, Wendy! We have definitely enjoyed it so far. Did you sell your old black oven? 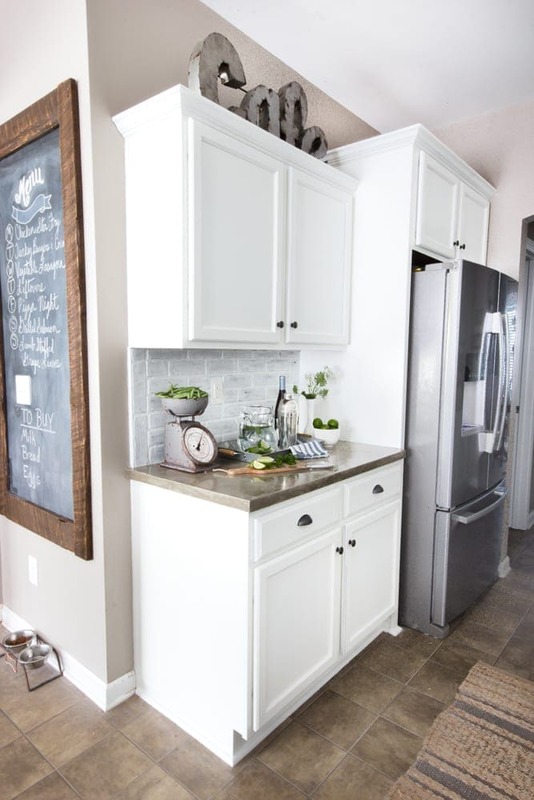 I’d love to do a white kitchen, but have all black appliances that are only 8 years old so I was thinking of doing taupe on the bottom and white on top. Hi Melissa! We actually donated ours to a charity. We’d planned on selling it, but knew of an organization that needed one, so we did that instead and found a good deal on our stainless steel one. I don’t know if I’d ever paint an oven. I’ve heard of people trying it and running into nightmarish results. Thanks for responding! 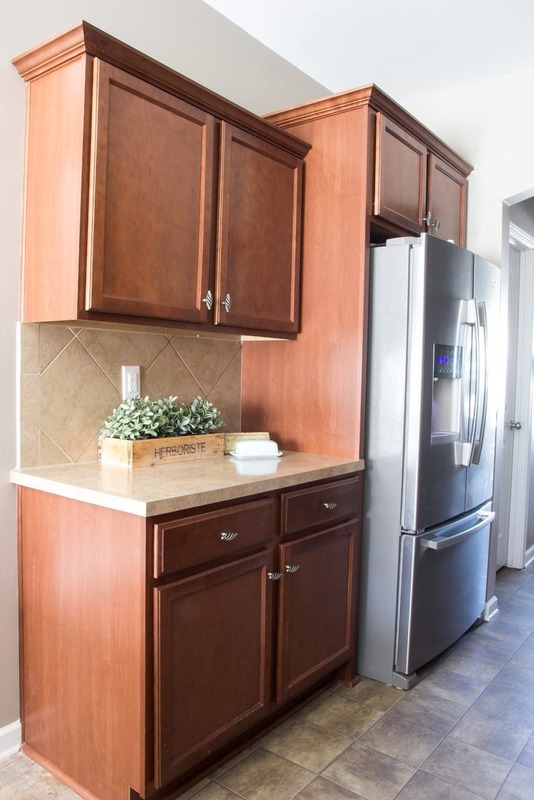 I meant I am toying with the idea of painting the bottom cabinets a darker taupe and the top cabinets white so the black appliances don’t stand out as much. My kitchen looks a lot like your ‘before’ pic except my birch cabinets give off an orange cast. The funny thing is my husband actually suggested getting white cabinets when we were building our house 7 years ago and for some reason I said “no”. I LOVE your kitchen! Especially the “farmer’s market” sign that you made. 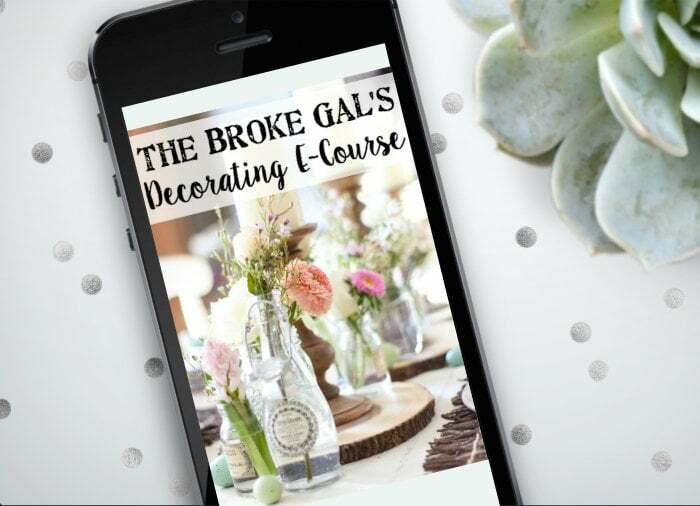 Do you have a tutorial or a blog on how you made it?? Would love to know so I can make a big one like that for my kitchen. I don’t understand why you didn’t have white cabinets installed when you built the house 2 years before? Why did you build a house and then spend all that time make these big changes? I’m confused. France?! I’m so jealous right now. Haha! Thank you for your kind words, Heidi. Wishing you the best in your new adventure. Looks amazing! Where did you get the faux white washed brick and how did you install it over your already existing tile? I’m desperate to update our dark blue slate tile in our kitchen, but it’s just not in the budget to rip it out and install new tile. Thanks! Hi Lauren. I found your post on Pinterest. Your kitchen turned out amazing! I am going to paint my oak cabinets white. I am going to get some help from a painter friend. I was going to use the General Finishes Milk Paint and then my friend told me about the Benjamin Moore Advanced product that you used. I see that you painted the cabinets about a year ago. I am wondering how they are holding up? Has the paint chipped or are there any issues with cleaning the cabinets? I would really appreciate your comments. I tried to find a follow up post on how the cabinets are holding up but I couldn’t find it. Wow what a beautiful transformation! Very inspiring! What type of backsplash product did you use? In our last home we spent a mini fortune on a marble tile backsplash that looks so similar to yours!! I noticed the microwave above the range wasn’t part of the original kitchen style. Was it hard to instal? Did you have to alter the cabinets in any way? We have drop down cabinets too and we’re concerned we might have to alter the cabinets in some way. 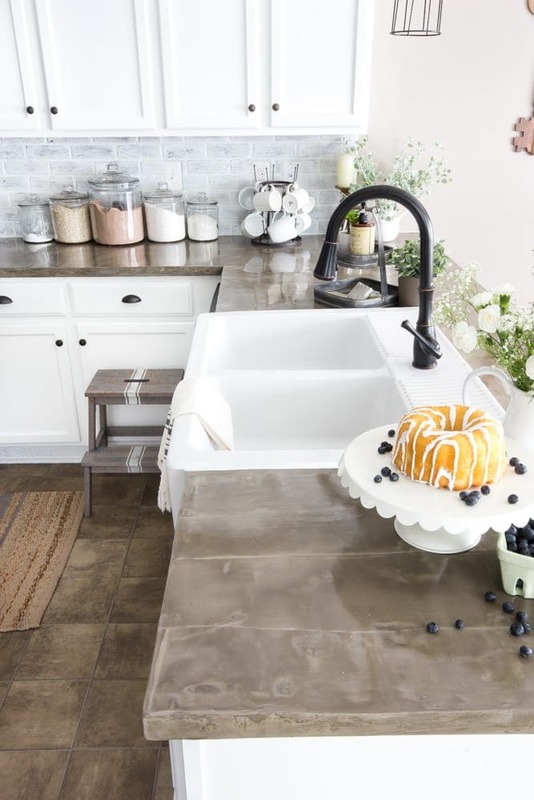 How did the concrete countertops hold up? It looks gorgeous! I noticed you have a 2-tone wall. Can you tell us what the 3 colors are? 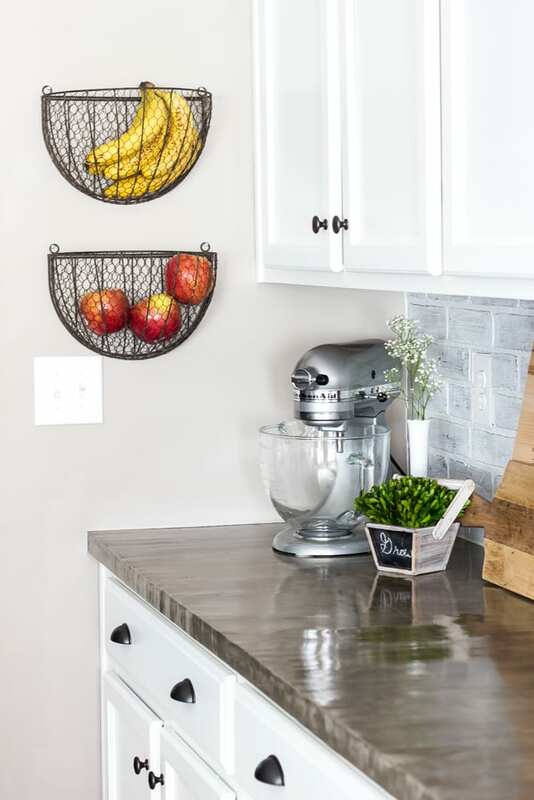 I love the faux brick backsplash! 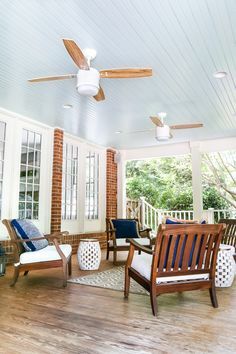 I’ve actually been looking into doing that in our remodel, I’m curious to know how you are liking them now? How well has it held up and how easy is it to keep clean? So gorgeous! I’m so inspired to do my kitchen now. What color Stick wood did you use? Thank you! Thanks! We used the regular reclaimed weathered wood color. More than just a gorgeous reno, it’s like it was supposed to look like that! It’s so inviting and reminds me of my own kitchen reno…I still stare at my own kitchen in awe lol and I bet you guys still do to! I didn’t see a mention of your backsplash. Just wondering where you found it. That’s exactly what I’m looking for. Did your remove your existing backsplash yourself? Or did you put the brick overtop? Hi, Vallerie! We put the brick on top. And the thickness of the existing tile that was already there actually made the brick look even more like the real thing. How did you do the brick backsplash? 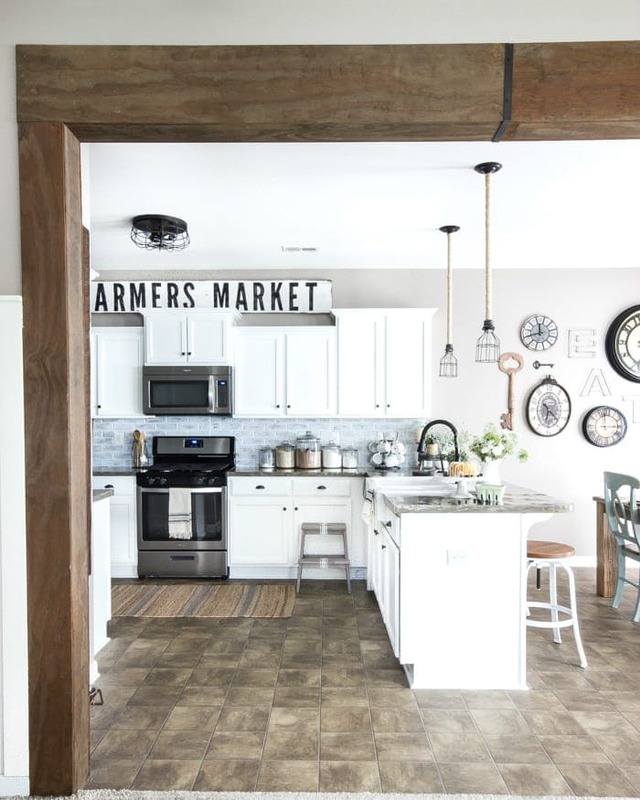 It was a great project that really added the farmhouse touch to the kitchen. I LOVE what you did. I’m browsing around on Pinterest getting ideas for our kitchen that I’m dying to redo! I LOVE those caged lights! How is the lighting with them? Do they give off much lighting? What is the color of paint in the room next to the kitchen? The wall with the “Fresh and Local” sign. It pairs so well with the perfect greige! Hi Miranda! It’s also Sherwin Williams Perfect Greige. It just looks different in the lighting. Hi Lauren, I (haha, truthfully my husband is) am working on remodeling my kitchen right now and have considered the feather finish concrete counters. I’m curious how yours are holding up. I see this post is about 2 years old. I hope you get this message! Thank you for your bravery and inspiration! When you open the cabinet door and look at the painted edge on the base cabinet, is it very noticeable that it was repainted? I’m nervous about the taping results on the painted edge. Hi Patti! You can tell it was painted if you’re really looking closely, but if you chose to spray the frames, you wouldn’t have that problem. I just decided to hand paint the frames though since I didn’t want to hang tons of plastic to do the spray. But we were still really happy with them hand painted. It looks beautiful, Lauren! It is nice to see that sweat equity pays off. I love the new sink, lighting and countertops! Our kitchen needs similar changes, so it is nice to see it can be done! Thanks for sharing! Lovely Lauren and all very realistically priced for the budget conscioused! Hey could you tell me how you did the Menu word on your chalkboard and the banner design underneath that word??? Is this a one story home? I’d love to see the floor plan! No it’s a two story house. Thank you! Nope, it’s just the sunlight hitting it and creating a different look. 🙂 All of the walls are Sherwin Williams Perfect Greige. Hi! I love the kitchen! I just wanted to ask- now that it’s almost 3 years later, how are the countertops holding up? I am looking for different ideas to fix up my counters and am intrigued by what you did. Any help is appreciated! Hi, Amanda!! We moved two years ago but when we visited the new owners a couple of months ago, they still looked amazing!! I love your kitchen so much and keep coming back to this post to read over and over. I want your kitchen! 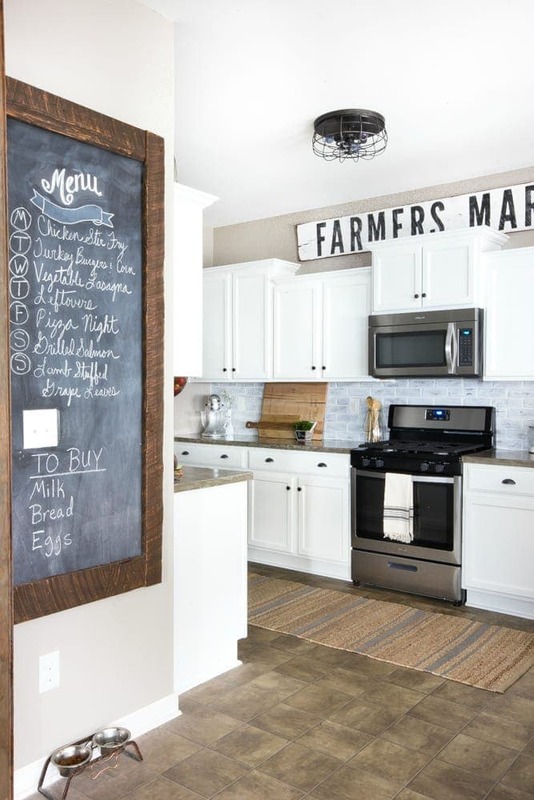 Any chance you did a diy tutorial on the farmers market sign in your kitchen? What font did you use?